Intellectual ‘Mind Work’ in Hawaii! The volunteer programs of most intentional communities in Hawaii involve physical work. However, at Hedonisia, we appreciate living in our rainforest paradise but we are not blind to the world’s problems. 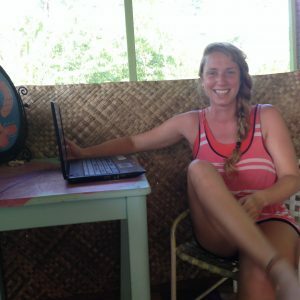 2015 Intern Heather on the Computer! Though we are a tiny community out here in the middle of the Pacific, we are actively engaged in social entrepreneur web projects allowing qualified volunteers to ‘work with their mind’ in the rainforest! Many Guests and Volunteers are only here for a limited time in Hawaii. They may prefer to do physical or creative work outside to balance their more indoor life on the mainland. So Mind Work is optional for Volunteers & Guests! Those wanting to do Body or Heart work can skip this section! In paradise, that is completely understandable! However, for those who are interested, please read on! Hedonisia Handbook. This is our evolving book on sustainable community management. It is also the training manual for all Interns. Our community projects are founded on the concept of social enterprise; creating businesses that address environmental and social needs as well as making a profit. HedonisiaHawaii.com and Hedonisia.com. We always need to update and edit content, photos, and info on our websites! Agricultural Tourism Plant & Garden Update: Our property is on 4 acres of rainforest. We are slowly identifying and photographing all the plants on the property and updating the plant data for the Hedonisia Garden Farm Inventory! Activist Entrepreneur: Our practical guide on how to create and manage a business by developing a product or service that improves society or the environment in a tangible way. Grant or Crowdsource Funding Writer – Experience writing Grant Applications to secure funding with relevant grants to help fund our social enterprise and community initiatives. Eco-Friendly Architectural Student – Draw plans for existing and future eco-friendly structures on the property. Assist in the preparation of blueprints of our affordable eco-tourist lodgings for submission to the County of Hawaii. Tech Geeks in the Jungle! Web Design, WordPress site maintenance. Apple or Android App Developers or other Techies with needed skills can also apply to be a Specialty Intern Community Member at Hedonisia. SEO & Social Networking – Essentials include great written communication skills, a marketing background, and experience with our social media pages. Examples would include Facebook, Instagram, Twitter, and YouTube with new sites being created all the time! Great for someone with social media skills! Search Engine Optimization would be for those with WordPress skills. b) Eco-Feminist Mind Work Web Projects! ‘Pleasurable Activism’ in Paradise! We have fun in our little island paradise but also work on feminist enterprise web projects with a global reach. Portfolio of EcoFeminist Web Projects. These are the sites we work on in the background that are part of the entrepreneurial activism we practice at Hedonisia. Interns provide assistance in site development and maintenance. EcoFeminist Entrepreneur: Our educational ebook teaching how women (and men!) can create a business to address female inequality on a local or international level and give themselves a job, career, and income that is based on their values and makes a difference. If interested, be sure to let us know in your application that you have special skills related to any of the above projects!